LUXURY family-friendly south-facing flat with stunning skyline views of Kraków Old Town & Kazimierz. Situated on the top-floor of prestigious former brewery Browar Lubickz. Just 7 min walk from Rynek Glowny (central square, location of Mariacki Cathedral) and 5 min stroll from train/bus station. 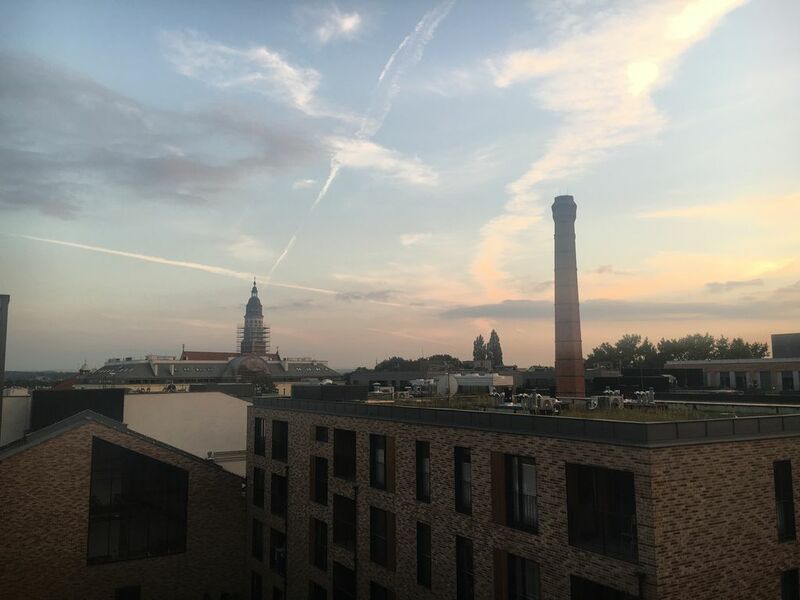 This is a brand new apartment with neutral decor that sets off the STUNNING SKYLINE VIEWS, CENTRALLY LOCATED within the prestigious Browar Lubickz former brewery development. All the furnishings and fittings are to a high standard with AIR CONDITIONING (in each room) are included as standard. The flat includes SUPERFAST WIFI INTERNET broadband/wifi (~100 Mbps), CABLE TELEVISION (with over 100 channels incl BBC, CNN, Bloomberg, MTV etc) and a FULLY FITTED KITCHEN (oven, induction hob, extractor fans, microwave, Nespresso coffee machine, fridge/freezer, dishwasher and washing machine). Bedroom 1 - DOUBLE MASTER bedroom, south facing, with en-suite toilet/bathroom opens out onto enclosed balcony with STUNNING VIEWS of Kraków Old Town, Mariacki Cathedral & churches. Guests have access to all the facilities within the Browar Lubickz development including CHILDRENS' PLAYGROUND (with sandpit, swings, slide), on-site DELI-supermarket, COFFEE SHOP and renowned craft brewpub/restaurant "Browar Lubickz". Prior to your trip we provide a detailed guide to the flat and the local area, including a selection of our favourite restaurants, coffee shops, bars and eateries (and handy things like how to use the dishwasher!). There's 24 hour security and key handover available on-site, just 30 seconds from the apartment. We've arranged for a local representative to assist with any urgent needs during working hours, too. We can recommend local tour operators for trips outside Krakow to the Wielliczka Salt Mines, Auschwitz and Dinorzatorland (for the kids!) and provide guidance on getting around the city. Ask us about SECURE ON-SITE PARKING in our UNDERGROUND CAR PARK accessible directly from the flat via elevator. The flat is very centrally located - just a few minutes' stroll to the Rynek Glowny (central square). The flat is located in a PREMIUM LUXURY development within a few moments of a new craft beer pub/restaurant and numerous restaurants, bars and coffee shops. The building is 5 mins walk away from Galeria Krakowska, the premier SHOPPING mall in the city with over 300 shops & restaurants. During the winter the plaza next door hosts a Christmas Market & ice skating rink. Over the summer, the plaza is host to a wide range of free cultural events, concerts and theatre. Being just 5 mins walk from the bus/train station makes the flat very handy for the Balice John Paul II International airport (by train, just PLN 8 each way - 18 minutes) as well as destinations further afield like Katowice and Warsaw. There are a wide range of trams and buses available from the stop on the street just outside the building. And charming Jewish quarter Kasimiersz is just a brief 15 minute walk away. By arrangement, we can provide SECURE UNDERGROUND FREE PARKING ON-SITE within the development, accessed from the flat by lift. Taxis are numerous and cheap - we recommend the iTaxi app to order a cab from the rank which is 2 mins drive from the flat. I have been living and working in Krakow for many years. This city is my passion. Formerly living with my young family in this beautiful flat, located in this historic, central district. * Beautiful skyline views across the city, including churches and the Mariacki Cathedral. * Quiet yet central location with 24 hour on-site security. * Just 25 mins from Kraków Airport by train or taxi. * Prestigious building with superior facilities - on-site deli, coffee shop, craft brewpub/restaurant, kids playground - in a pedestrianised setting. * SUPERFAST wifi internet throughout plus large plasma TV over 100 cable channels (including MTV, BBC, CNN etc). * Secure on-site underground car parking available by arrangement - avoid the parking charges and problems with on-street city parking. Air conditioning in every room, controllable in a per-room basis. Cosy central heating included for rentals over the winter. Each guest bed made up with pillow, duvet, sheets. Full washing machine with range of programmes available. On-street parking in Kraków can be difficult and expensive - we can include by prior arrangement SECURE UNDERGROUND PARKING ON-SITE for small charge - ask for details. Simple, convenient, secure! SECURE UNDERGROUND PARKING ON-SITE available at small additional charge - please ask for details. Wireless internet - SUPERFAST over 100 mbps. Includes cable TV with over 100 channels including BBC, CNN, MTV etc. Each guest provided with 2 towels. Large integrated fridge with freezer. 4 ring induction electric hob. Fully equipped kitchen with electric job and oven, microwave and wide range of pans, utensils, glasses, plates and cutlery. Luxurury flat-screen TV with cable channels included. Over 100 channels including BBC, Bloomberg, CNN, MTV and many many others. We provide a range of books including local tour guides, history, kids books and novels for your enjoyment. Selection of table top games. Beautiful, quiet gardens with many specimen trees and shrubs within the apartment development. The perfect place to relax in the midst of the city, a quiet oasis. Covered balcony with table & seating with superb rooftop views of the city towards Mariacki Cathedral and Old Town. Perfect for al fresco dining all year round. Level access from street level and underground parking. Modern lift with accessible doorways takes guests to the top floor where flat is located. Check-in between 3pm-6pm weekdays (weekends/national holidays and out of hours/late checkin possible by prior arrangement. Please ask before booking). Check-out before 10am. Late check-out may be available at additional cost - please ask for details when booking. Please enquire about discounts for longer stays (bookings of 28 days or more). Good location and quite comfortable. We stayed here with our two teenage children and we walked from the train station with our luggage through the snow. Not easy, but only a short 5 minute walk really. The keys were easy to obtain, but unfortunately no security code was given to us so after much translation with the security guards he put one in for us. The building is nice and modern and the lift a great feature with lots of luggage. They very kindly allowed us an early check in as our train arrived in the morning. It was quite sufficient for our stay of 5 days, but our daughter who had the single bed said it is right against the lift and it was all she could hear when the lift was going up and down. I don't think insulation is a high priority in Europe as we had this problem of noise from other apartments wherever we went. Beds were comfortable and sofas etc the only improvements I could suggest were that the bath towels were tiny and very thin and the whole apartment could have done with a really good clean, and unfortunately the previous renters had not cleaned the plates and cutlery properly after use. Heating was good, and there were plenty of pots and pans etc if you wanted to cook your own meals. Unfortunately the supermarket in the complex had shut down so we went to the shopping centre across the road (which also connects to the train station) which has a largish supermarket and plenty of shops. We also found a great cafe called Wesola Cafe who served great coffee and food, do yourself a favour and look it up. Its about a 5 minute walk away. As the train is so close, you could catch it to Auschwitz, we caught the train back from there and walked back to the apartment. Unfortunately is was too cold while we stayed to use the little balcony but it was cute. Overall a great little place to stay while in Krakow. We stayed at the appartment in October and had a fantastic stay. Location could not be better just a stroll from the main train station and shopping centre - takes no time to get your bearings. Appartment is clean, modern and really well equipped with good size rooms and loads of space with the balcony a bonus to sit out and relax on. Macs guide was really useful and public transport easy - trams are a great way to get around. We didn't have enough time to do everything we wanted so will definitely be back!. Would highly recommend this apartment. Great apartment, very clean on arrival and plenty of space for three adults and a teenager. Sunny balcony was a lovely bonus. Easy to pick up the keys and a 10 minute walk to main square. Supermarket located in complex was very handy. Owner was very helpful and quick to respond to any questions, also provided recommendations for places to eat which were great! Would recommend and we would stay here again. Great apartment, loved the location. We enjoyed our time at the apartment on Lubicz. The property is well located and a short walk to the Krakow Glowny, Galeria Krakowska Mall, the Planty Park, the Old Town and the Kazimierz district. The apartment is large and well outfitted with a lot of room for our family. The weather was very warm during our time in Krakow and the air conditioning worked very well. The grocery store in the base of the complex is very convenient and well stocked. There were just a few very minor issues in regards to an extremely noisy door on the masterbedroom ensuite and the lack of hooks or towel racks for the hanging of bath towels or robes. This property is a great value and I recommend. My family of five adults (2 couples and 1 single) stayed three nights in July. The apartment was large enough for five adults with a lovely balcony off the master bedroom which also has a half bath (toilet & sink). The apartment is within easy walking distance to the old market square, the castle, the mall and many good restaurants. We had a car and the parking space was a bonus. The apartment was well stocked with everything you need for s comfortable stay. To pre-arrange secure on-site parking, please contact us for a quotation before booking. Parking is GBP 5 per night booked in apartment. If you require parking, it must be pre-arranged with us at the time you make the booking.